To use these options, long-press anywhere in the move list area. Then, the following menu appears. 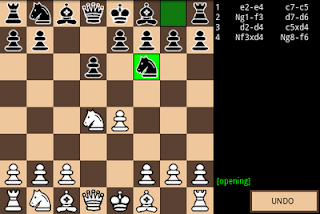 Select one, then exit the chess application and go to the application where you want to paste the game. For example, I picked Copy Moves as PGN and went to messaging and long-pressed the text area. Then Paste the contents of the clipboard into the message, and the game appears in PGN format (note that, for convenience, I use a slightly more elaborate algebraic chess notation than strictly required; readers should still accept that format though). Likewise, using Copy Position as FEN, the contents would look as follows. 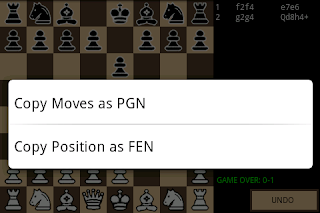 I added an opening book to Chess for Android. The opening book is small (slightly over 150 opening lines) and simple (transpositions are not recognized, unless the line is explicitly stored). Nevertheless, since the engine picks a matching line at random during the opening, the variety of play will increase. Version v1.2.8 (and onwards) supports the opening book, as well as a new copy-to-clipboard feature (more about that later). While still in an opening line, the message "opening" appears at the position that usually shows the engine evaluation, as shown below. This game cheats. Pawns shouldnt be able to capture pieces next to them and then move diagonally. Really, my game gets one star because you cannot find the menu button on your own phone, or because you don't know the en-passant rule (see also previous posting)? Please, if you don't like the game for a good reason, by all means give one star. But this?